I am the intersection of music, movement and imagination turning my body into a human drum to preserve the customs and traditions of percussive dance forms created by people of color in America. I titled this ongoing work in progress, The Human Drum, simply because that what I am, a percussive instrument that incorporates movement to entertain. After years of training, traveling and learning percussive dance styles, The Human Drum is the sum total of my life experiences expressing spiritual emotion that I’m unable to express verbally. A mega mash up of rhythms from Brazil, America, South Africa fused with audience participation inspired by comedians, tap dancers and the conductors of Jazz Bands in the 1920s, The Human Drum is an improvisational rhythmic roller coaster, breaking the fourth wall, turning any audience into my personal orchestra. For me, The Human Drum is my personal expression of emotion, while pay homage to the artist who have inspired me, allowing my ancestors to move me and celebrate the life of my mother. I titled this ongoing work in progress, The Human Drum, simply because that what I am, a percussive instrument that incorporates movement to entertain. KuKu is traditionally a circle dance and drum rhythm with origins of West Africa, that is used to celebrate harvest and other events. My goals was to dissect the rhythm of the drums, while infusing it with other global rhythms intersecting tap dance, stepping, body percussion and vocals to build a multidisciplinary performance work. This polyrhythmic expression of song and dance demonstrate the intricate rhythms and vibrations of the world. Currently, in its third rendition, I’ve continued to work with Tamar Greene, currently playing George Washington in Hamilton Chicago, to masterfully arrange the opening song Niakhaling Ba and powerhouse choreographer Quynn Johnson of SOLE Defined to insure that the interpretation of movement is in enlightenment with the history and traditions of Guinea, West Africa. 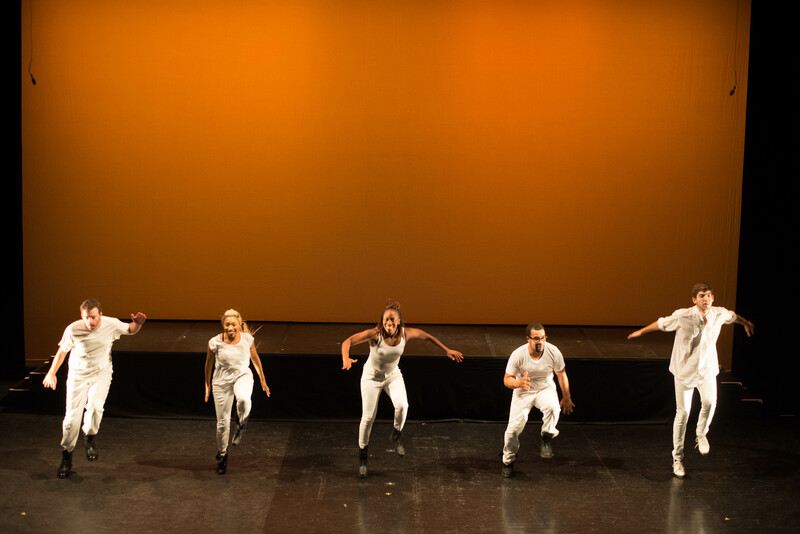 Between 2015-2018, Kuku on Taps has been performed on stages across the nation including, The John F. Kennedy Center, The Lincoln Center’s Clark Theatre, and Jacob's Pillow Inside/out festival to name a few. KuKu is traditionally a circle dance and drum rhythm with origins of West Africa, that is used to celebrate harvest and other events. My goals was to dissect the rhythm of the drums, while infusing it with other global rhythms intersecting tap dance, stepping, body percussion and vocals to build a multidisciplinary performance work. I teamed up with vocal powerhouse Tamar Greene, a friend and world renowned performing artist. Tamar holds his M.M from the Eastman School of Music in Vocal Performance and Literature, he also holds a B.A in music with a focus in Piano Performance. When I approached Tamar, I knew I had an idea however I didn't know how to "chart it". Well Tamar did! We spent hours doing research, including interviews with people from the west coast of Africa to insure we upheld the true traditions of the song while adding our contemporary approach. I continued to cultivate my partnership with choreographer, arts educator and author, Quynn Johnson to collaborate and build A Tribute to Sandman. Howard “Sandman” Sims (January 24, 1917-May 20, 2003) was a legend in the tap community, known for sending people offstage during Showtime at the Apollo and for his epic “challenge” tap battle against Bill Cosby on The Cosby Show. Quynn and I wanted to find a way to keep his work and energy alive! We began to research footage of Mr. Sims, exploring his movement qualities and his approach to the technique. Followed by research of other art forms on the continent of Africa in hopes to find any similarities and/or inspiration. We found footage of amazing dancers from Botswana with a movement quality that is out of this world! Inspired by Mr. Sims, the traditional movements of the people of Botswana, and the Gumboot Dance of South African, A Tribute to Sandman was born. Inspired by Howard “Sandman” Sims, the traditional movements of the people of Botswana, and the Gumboot Dance of South African, A Tribute to Sandman was born. Old School is an original work inspired by the sounds, culture and street performers of New Orleans, LA fused with show stopping tap dancing honoring; Honi Coles, Gregory Hines and Baltimore Native Dr. James “Buster” Brown. This masterful blend of Brass music and Tap dance continues the long lasting relationship of two American art forms that are deeply rooted in our history dating back to the early 1700s. As an artist, arts educator and arts advocate I value the impact, influence and inspiration Tap and Jazz has had on our culture, art, films, and onstage productions. It is imperative for me to preserve and honor these two art forms. 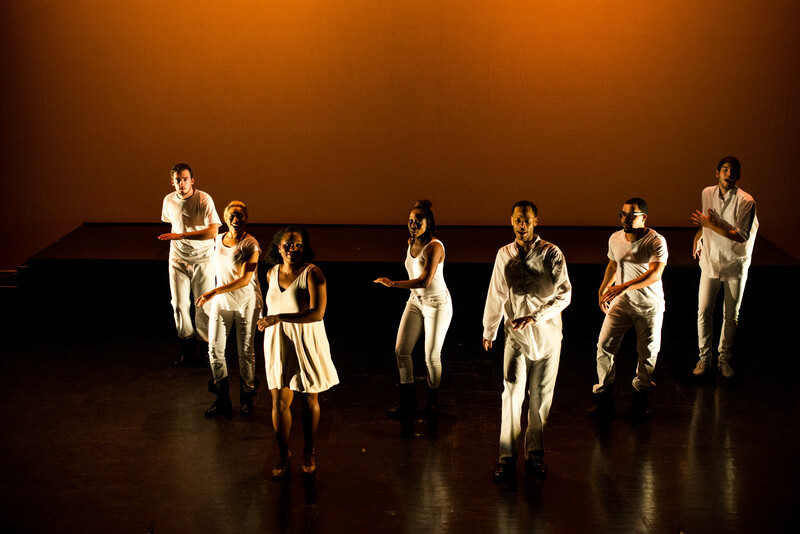 Old School is an original work inspired by the sounds, culture and street performers of New Orleans, LA fused with show stopping tap dancing honoring; Honi Coles, Gregory Hines and Baltimore Native Dr. James “Buster” Brown. Percussive Dance is the perfect blend of music, movement and emotions full of endless possibilities. In hopes to expand the exposure of the art form, I started working on a solo album consisting of seven global rhythm tracks performed by my body. The Heartbeat was written to address a common question I received after performances; “where do all your rhythms come from?”. The short answer to that question is my heart, I truly believe percussive dance is a part of my DNA and spiritual makeup. Percussive Dance is my way to express emotion, address social injustice direct affecting people of color, and create a safe space for transparent conversation between people of different backgrounds. I was approached by Moxie, a marketing firm for BB&T bank in December 2017, expressing interest in The Heartbeat and Body Percussion for an upcoming campaign. Again, with the hope to advance the art form and providing a platform for the masses to experience, I agreed to choreography, perform and use The Heartbeat for the 2018 BB&T Zelle campaign. My mission is to create high quality performing art that address the social and political climates that have historically affected people of color, challenge the ideas of racism and classism, and develop arts integrated programming for K-12 students; all while preserving the history and movement of percussive dance. Untitled is a new creation built during five day arts integrated residency, with dance prime students at Carver Center for the Arts and Technology. Untitled is a multidisciplinary work including house dance, stepping, body percussion, gumboot, and modern inspired movement exploring unity amongst young women as they walk their individual paths. It is important for me to create work that allows space for emotional and social growth for students k-12. The Golden Age of Hip Hop was a defining moment that continues to leave an indelible mark on our culture, identity and way of life even today! An innovative, ground-breaking sound where music was used as social protest, Afrocentric expression, and a celebration of life. SOLE Defined takes us on a journey back in time to The Golden Age of Hip Hop, fusing a live DJ, Tap Dance and Stepping. Baltimore native, DJ The Kid, spinning the sounds of the 90’s, on the turntables while SOLE Defined blends the sounds of their feet taking the audience on a rhythmic roller coaster, turning The John F. Kennedy Center for the Performing Arts Millennium Stage into one big party. SOLE Defined workshops their brand new show title VIBEZ. An innovative, ground-breaking sound where music was used as social protest, Afrocentric expression, and a celebration of life. 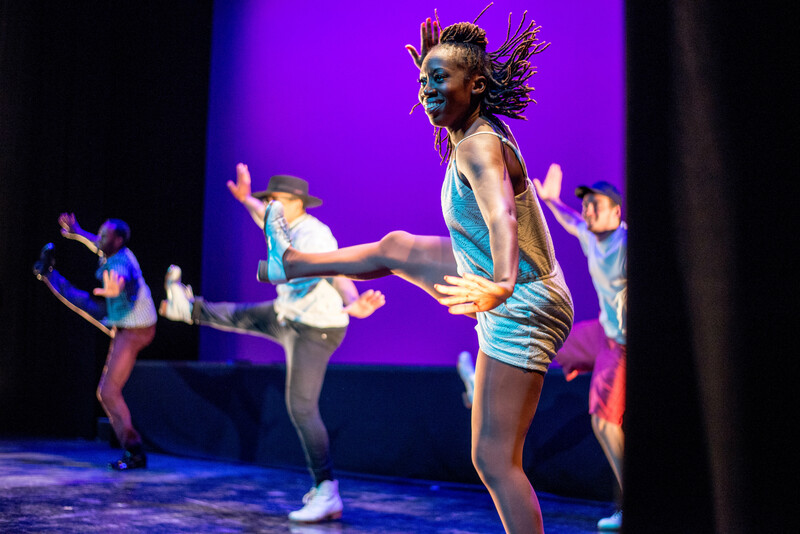 Artistic Director, Ryan Johnson leads SOLE Defined as they take us on a journey back in time to The Golden Age of Hip Hop, fusing a live DJ, Tap Dance and Stepping. This is the full evening performance of Zaz on Millenium Stage.